Shakers offers a very specific, tailored to customer service. 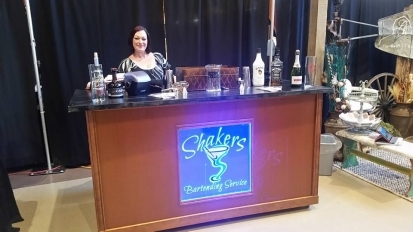 Shakers is INSURED and very much pride ourselves on the professional level in which we do business. From the design of the drink menu, to the order, pick up, delivery, set up of all product and service. For most events, there are 2 bartenders provided. If your event is in need of a bar, we will provide that bar at NO extra cost. All of our alcohol we are able to save the client on financially. We have formed a great bond with Price Cutter who we have done business with over the last 2 years. Shakers makes no money on alcohol at all. It is important for my potential client base to understand the difference between our service and “theirs”… you may be able to get a sub contracted bartender who you have no relationship with, have probably never met until the day of your party and has never encouraged their clientele over the past year to contact them at midnight if necessary… all for $150. But you will be spending 30%-40% more in alcohol than you would be through Shakers Bartending Service. So where is the savings?